JOHOR BAHRU: THE state government has urged tour agencies to start offering tour packages to the royal town of Muar as boost efforts in promoting the place as a major tourist destination. State Tourism, Domestic Trade and Consumerism executive committee chairman, Datuk Tee Siew Kiong, said Muar has a lot to offer in terms of tourism products. These include historical buildings like the Sultan Abu Bakar building and the Bukit Kepong police station, as well as nature destinations like Gunung Ledang. 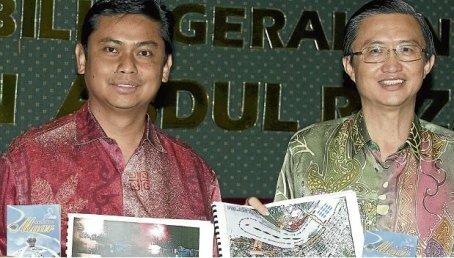 “Tour agencies and others from the private sector can come up with a lot of ideas that we can explore, like organising a photography competition to document the history of Muar and to record the uniqueness of the tourist destinations there,” said Tee. Tee was speaking to the media after a Press conference to announce the boat float parade that would be held in Muar in conjunction with the Sultan of Johor’s birthday celebrations. He said 30 participants from the public and private sectors would be taking part in the parade, to be held on Nov 24 at Sungai Muar. “There will also be cultural performances and firework displays at the venue,” said Tee. Tee said a total of RM30,000 in prize money would be up for grabs for the participants with the most beautiful and interesting boats in two categories of small boats and big boats. “Those from the private sector who want to participate in the parade are also welcome,” he said.